Finally the days are growing longer and lighter, the snow is melting and your mind turns to all things "travel". It won't be long before you are planning your next RV road trip! This in mind, perhaps it's a good idea to begin making plans to prep the RV for the upcoming travel season. Along with checking the engine and tires, make sure one of the first items on your list is to de-winterize the RV plumbing system. If that whole process seems a little "fuzzy" we totally understand! We only do this once a year, right? To that end we thought you might find a review of the de-winterization process helpful. Although every RV handles the de-winterization process a little differently, the tasks are pretty similar. You need to empty the antifireeze from the system, prep the water heater, and test the system. Here are a list of the steps we use to de-winterize our RV. Even if your process is different, the general flow will probably be quite similar. Make sure you change the water system valve from “winterize” to “normal” before you begin. Fill the water tank from a faucet using the “water tank fill” position. Check to see if you have a valve for "Winterization". Make sure it is in the "Normal Flow" position instead of the "Winterization" postiion. Get out the fresh water supply hose and connect it to a nearby fresh water faucet. Turn the water valve to the "Water Tank Fill" position. Fill the tank. Monitor the level to make sure you don't overfill the tank. Turn off the hose when the tank is full. Then, turn the valve to the "Normal/City Water" position. Check the water pump to make sure it is ready (some may have a winterization plug). Check the water filter to make sure it does not have a filter cartridge in it. Since we are flushing the anifreeze out of the system we will wait to add the filter cartridge. Make sure the filter canister is firmly in place. To flush the system, turn on the water pump and run water from each faucet, one at a time, until the water runs from "pink" to clear. This indicates the RV antifreeze is out of the tank. Don't forget the shower, toilet and toilet sprayer and outside shower,if you have one. Now it's time to fill the water heater. For this example we will use the hose and "City Water" to fill the water heater. You can, however, fill the water heater with the on-board fresh water tank using the water pump. It makes more sense to us to do this connected to a City Water source to reduce the wear and tear on the water pump. Small RVs have small water pumps, usually tucked in a cabinet. Turn on the water hose connected to your home faucet. Reinstall the water heater drain plug and close the pressure relief valve. 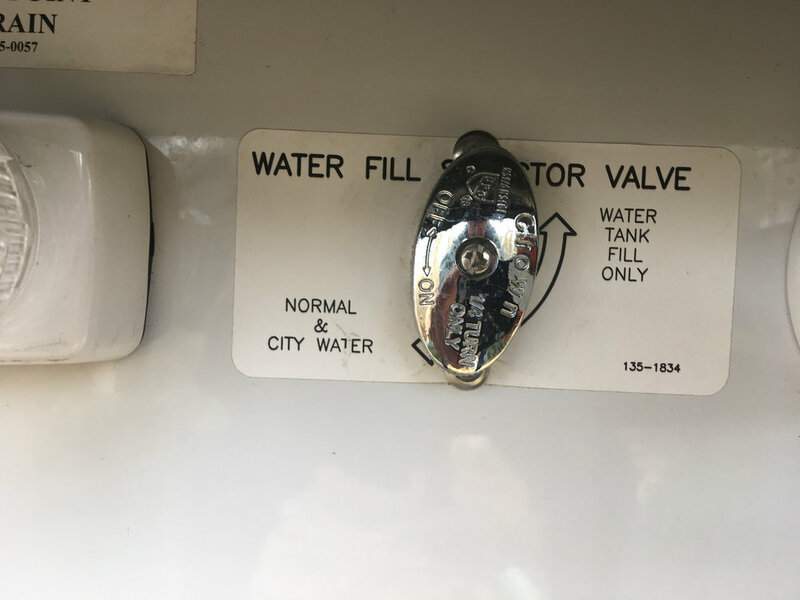 Make sure the hot water tank valve is turned to the "Normal Flow" position rather than the "Bypass" position (In our unit, this valve is on the water heater itself inside the RV). As soon as you rotate the valve to the "Normal Flow" position you should hear water filling the hot water heater. This is a good time to check for leaks around the drain plug (the one you just reinstalled). Keep an eye on the tank levels with the tank monitor panel. Once the water heater is filled, ignite the heater to make sure all is working smoothly. Let it heat the water and then turn on the shower and sink faucets to check the water temperature. Carefully unscrew the water filter canister using a basin to catch any water that is in the canister. Empty the canister and install a new water filter cartridge. Replace the canister and tighten. When de-winterizing, make sure to set the hot water heater valve from “byapss” to “normal”. If the RV has been in storage all winter long and filled with the pink non-toxic antifreeze, the plumbing system should be just fine. But it doesn't hurt to test all of your systems after a long period of storage. That means the water pump, the water heater, and all the facilities. We like to do a "test" camping trip at a nearby state park for a night or two to make sure everything is working properly. We run through the city water hook up as well as trying out the on-board fresh water tank. The water pump gets a work out when we use the fresh water tank so we can detect if it is unusually noisy or if the pressure seems weak. Either will send us into troubleshooting mode. At the same time, we make sure all the drains are emptying properly too. We test the hot water heater with showers and time how long it takes to recover. It's important to make sure the water is hot enough for showers. If not, it could mean some repairs or a replacement is needed. We inspect the fresh water supply hose to make sure there are no leaks or cracks and check the ends to make sure they are not crimped from being in storage under something heavy. The service bay gets a good look over too. We check for any drips or leaks that might indicate a new gasket is in order or perhaps the fresh water filter screen needs to be cleaned. All the valves get a work out when we dump the tank. Some RVs may require the valves to be lubricated as a part of regular maintenance. We also inspect the dump hose (probably the 'icky-ist' part of the job!). We look for cracks, holes, and leaks by running water through the dump hose. Since we have a macerator installed, we listen to the sound it makes when operating to make sure it it running smoothly. If it sounds weird, or the tank takes too long to empty, we'll take it to the service center for maintenance. We check the macerator hose by draining some of the gray water tank and look for leaks. With the de-winterization process complete, we are ready to clean up the unit, get it restocked and ready for our first trip of the season!